A long time ago I became frustrated with having to update my WordPress plugins manually, so I created a Perl script and a blog post (https://blog.vpetkov.net/2011/08/03/script-to-upgrade-plugins-on-wordpress-to-the-latest-version-fully-automatically/) that explained how to automate this. The idea was quite simple: feed a plugin name, have the script check the WordPress plugins page for the latest versioned download, grab it, and extract it over the specified blog plugins directory and thus update the plugin. The script was simple and it worked very well. It made dealing with plugins many times easier. However, there was one big down side as some users pointed out — it did not actually check if a plugin needed to be updated. It blindly replaced the current plugin with the latest version. This meant that there was no way to “efficiently” automate it. If you cron-ed it directly, it would simply pull and update all your plugins at whatever period you specified. For the longest time this really irritated me, but I didn’t have time to dig through WordPress to understand how the engined checked and signaled for local plugins. One particular user (Joel) forked a copy and made many improvements to deal with this specific issue. In this day and age where everything is measured, recorded, and available remotely (via a REST API most of the time! ), it really bothered me that our heating oil tank measured the remaining gallons of oil by a crude plastic dip stick. It’s not accurate, there is no historical data, and there is no way to audit (for honesty, accuracy, or problems/errors). So the problem is simple enough: Find a quick and easy way to remotely monitor the number of gallons of heating oil in a home, and alert at pre-set intervals (let’s say 75%, 50%, and 25%) of remaining oil in the tank. After looking for commercial solutions, the cheapest one I found is $120 with a $10/year fee. In my view, that’s simply ridiculous. I decided that I could build something better for 1/3rd of the price ($40), without an yearly fee. This should take care of the hardware side. 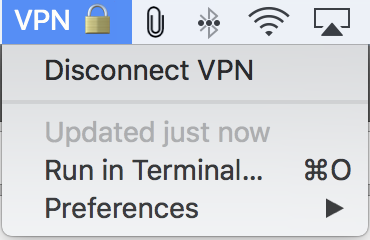 You need to connect to a Cisco AnyConnect (or Juniper Pulse Connect) VPN, and you cannot stand the default client for a variety of reasons (slow connects, crashes, unable to start, pointless pop-up notifications, crashes, pid-loss, etc), and so, you look for alternatives. You find OpenConnect – the perfect solution, only to realize that the 3rd-party GUI is basically broken and actually doesn’t work (last checked on 8-14-17) with 2-Factor authentication (ex: Duo). 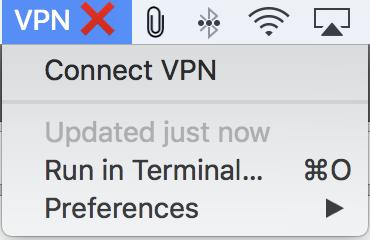 At this point, you can run OpenConnect from a terminal, which works, but you have to keep the terminal open and you have to wrap the long command in a shell script. Or, you can use my little solution which seems to work perfectly. I needed a way to monitor Docker resource usage and metrics (CPU, Memory, Network, Disk). I also wanted historical data, and ideally, pretty graphs that I could navigate and drill into. Whatever the solution was going to be, it had to be very open and customizable, easy to setup and scale for a production-like environment (stability, size), and ideally cheap/free. But most of all — it had to make sense and really be straight forward. The idea is that you first launch Grafana, and then launch InfluxDB. You configure Grafana (via the web) to point to InfluxDB’s IP, and then you setup a Telegraf container on each Docker host that you want to monitor. Telegraf collects all the metrics and feeds them into a central InfluxDB, and Grafana displays them. https://blog.vpetkov.net/2015/12/07/docker-swarm-tutorial-and-examples. It’s very easy, and it should give you an idea of how it works within a couple of minutes. Using Swarm with pre-generated static tokens is useful, but there are many benefits to using a service discovery backend. For example, you can utilize network overlays and have common “bridges” that span multiple hosts (https://docs.docker.com/engine/userguide/networking/get-started-overlay/). It also provides service registration and discovery for the Docker containers launched into the Swarm. Now lets get into how to use it with service discovery – which is what you would use in a scaled out environment/production. But if you want to use all of these docker engines as a cluster, you need Swarm. Here we will go one step further and use a common service discovery backend (Consul). Recently I tried setting up a Plex server in a docker container. The first problem was the 127.0.0.1:32400 bind which required logging in locally or port forwarding. After doing this once, I realized that you could use the Preferences.xml file, but that meant that you couldn’t truly automate this/deploy it elegantly in a docker container. And what if you wanted to run other servers — for friends? I finally figured out how to do this in the most elegant way possible. At this stage DO NOT click log out of your account until you register the new server. Otherwise your token will regenerate. Once you register the server, it won’t matter after that if the token changes. One of the biggest benefits to using Docker Swarm is that it provides the standard Docker API, which means that all of the existing Docker management tools (and 3rd party products) just work out of the box as they do with a single host. The only difference is that they now scale transparently over multiple hosts. After reading up on it HERE and HERE, it was evident that this is a pretty simple service, but it wasn’t 100% clear what went where. After searching around the web, I realized that almost all of the tutorials and examples on Docker Swarm involved either docker-machine or very convoluted examples which did not explain what was happening on which component. With that said, here is a very simple Docker Swarm Tutorial with some practical examples. This problem starter as a rather simple one — I needed to send HTML emails, using Perl, to a remote SMTP server with user authentication and TLS support (STARTTLS). The extra “gotcha” is that I refused to read books about MIME structures. Easy enough right? It turns out, it can be if you know the right answer. That’s it — and “it just works” ™. As you might have guessed, this is also the perfect solution for something like Amazon’s AWS SES service. The guys at Qualys discovered a very interesting buffer overflow in the __nss_hostname_digits_dots() function of glibc. The main problem is that you can take advantage of this remotely via the gethostbyname*() functions, which are used in many applications. They dubbed this “GHOST” (due to the GetHOST… name). The CVE assigned to this is: CVE-2015-0235. Currently, all distributions of Linux are vulnerable. This was apparently fixed between glibc-2.17 and glibc-2.18, but it was ignored in the long term “stable” releases.